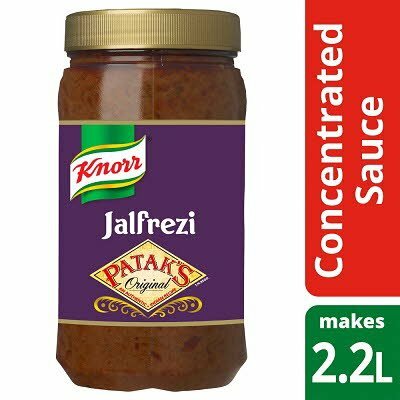 A concentrated Jalfrezi Sauce combining tomatoes and coconut with an authentic blend of spices. Water, rapeseed oil, sugar, concentrated tomato puree (4%), coriander powder, modified maize starch, desiccated coconut (2.5%), garlic puree, dried onion, salt, ginger puree, spices (contain MUSTARD), paprika powder, turmeric powder, cumin powder, acids (acetic acid, citric acid), dried crushed red chilli, dried coriander leaf, cumin seed, paprika extract, ginger powder. Made in a factory that uses nuts and peanuts. Store in a cool, dry place away from direct sunlight. Once opened, keep refrigerated and use within 5 days, or freeze remaining contents immediately. Defrost in a refrigerator and use within 24 hours.